Pizza, pasta, calzone and stromboli… delicious Italian foods that you’ll find cooking in the busy kitchens of Parisi’s Primo Pizza & Pasta Restaurant, located in Barrington, Illinois. As those hand made crusts are being tossed in the air and baked in the ovens, you’ll also find large amounts of flour dust and oil mist circulating throughout the air, coating appliances, condenser coils and other costly equipment necessary to run a very busy kitchen as successfully as Primo does. After cooling and ventilation systems have been installed, many mechanical contractors find themselves rigging an air filtration solution to protect the costly equipment from this hostile restaurant kitchen environment. Primo Pizza & Pasta Restaurant’s condensing unit had just been replaced because of the huge amounts of contaminant that were continually circulated throughout the air. Coils and electrical components were coated with an oily/flour mixture. The condensing unit’s location on top of a Norlake KoldLocker walk-in cooler made it hard to clean the coils regularly and the restaurant’s unit has already failed due to excessive heat and dirty coils. Self rinsing coil cleaner was recommended by the manufacturer, but there was no place for the cleaner to run off, except down to the counters, and possibly on to the food preparation areas. Airflow obstruction s and coated coils in this type of equipment can be a costly expense, requiring continuous cleaning to prevent equipment damage and to allow the system to run at peak efficiency. James Wilson, of James Mechanical Company, located in Genoa, Illinois, was called in to replace the condensing unit.The original filtration fix consisted of a 1″ tack type nonwoven polyester pad, which had to be duct taped to the front of the fins. This pad had to be changed at least once a month. The blue pad shown above had just been replaced, and after only a day, it was coated and filthy. James Mechanical found a cost effective and long-term air filtration solution for their customer with Permatron’s patented PreVent® Equipment Protection Air Filter. These air filters are made of washable, woven synthetic polypropylene media, which draws in and traps airborne particulates. The electrostatic media, enhanced by airflow needs no system modifications or electrical hookups. 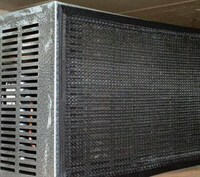 A PreVent custom air filter was made to the exact size of the protective fins and framed in black vinyl. The filter was then affixed to the outer perimeter of the air intake by a hook/loop attachment sewn onto the vinyl binding. 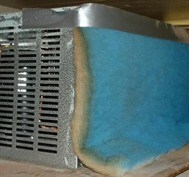 Hook Velcro was attached to the condenser with adhesive backing, but magnetic stripping, with a stainless or galvanized steel frame, could have also be used for attaching filter to fins. PreVent filters are easily removed and cleaned by spraying with a degreaser and rinsing with water or vacuumed in place by using a portable shopvac. The three-dimensional media is UV protected and contains an inherent electrostatic charge that doesn’t diminish over time, so filters can be used indoors or outdoors, providing years of equipment protection. PreVent® the damage before it’s too late!